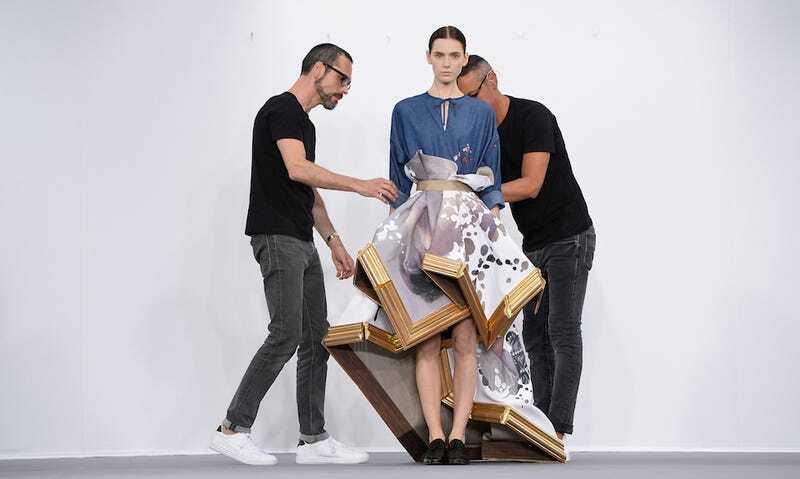 For their fall 2015 couture show, Viktor & Rolf—who recently announced they’ve quit the ready-to-wear business in order to focus entirely on couture—put models in an increasingly elaborate series of deconstructed artwork, frames and all. Despite the overused, over-literal implication of “wearable art,” the collection works—and the show itself, in which the two designers removed certain garments from the models and arranged them into triptychs and sculptures on the wall, adds a spur-of-the-moment yet totally practiced and deliberate performance art vibe that both complements and contextualizes the collection, protecting those absurd proportions from feeling too too. The duo opted for a combination of classic paintings from the Dutch Golden Age and action painting technique, “so that you have the aggression and the rawness of the action painting and the classicism and precision of Golden Age,” Horsting explained, drawing attention to the fact that all the canvas was essentially fabric, embroidered with yarns and appliqués that looked like paint splatter, or jacquard prints. Art dealers were scattered throughout the audience, and renowned art collector Han Nefkens has already pledged a purchase, which will be donated to the Museum Boijmans Van Beuningen.